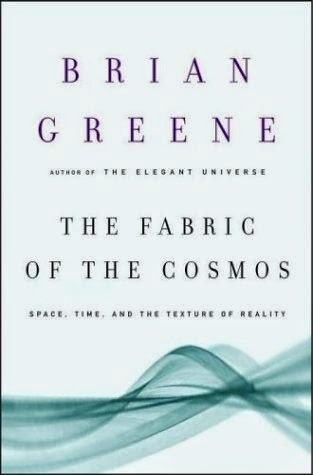 I picked this book - The Fabric of Cosmos: Space, Time, and Texure of Reality - up Saturday afternoon, and read the first 3 chapters. I decided that I have been reading too many fiction lately, and haven’t read much non-fiction. Every now and then, it’s good to pick up some heavier material to occupy your brain with. And there’s probably not much material out there heavier than the nature of space and time. Is space an entity? Why does time have a direction? Could the universe exist without space and time? Can we travel to the past? The ultimate questions pondered by philosophers and physicist throughout history. The book has a very minimalist and yet elegant cover, it’s the picture of some out of focus fabric, which matches the book’s title. Brian Greene, one of the world’s leading physicists who teaches at Columbia University, is set out to describe superstring and M-theory to the general public in this book. As he described early on in the book, we as humans gain appreciation for our world, when we truly understand the inner workings and truth of things beyond our limited senses. Yes, we can no doubt look up the night sky and see and appreciate the vastness of space and time with our eyes, but this is not what drives scientists. Scientists want “to assess life and to experience the universe at all possible levels, not just those that happened to be accessible to our frail human senses.” It’s a passion for beauty and truth. In fact the basis for string theory is the believe that theory of general relativity (works well on big objects and distances) and theory of quantum mechanics (works well on small objects and distnaces) should not contradict. String theorists are believers of an elegant universe, that there ought to be one way to describe the nature of all things.